Did somebody hit the FF button? 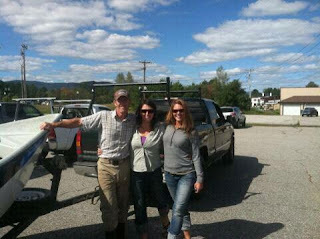 The 2011 Upper Andro 2 Fly is in the books and team Patagonia represented this year, in a big way. No, Scott, Mike, and I couldn't fish due to other commitments, so Emily, my wife, and good friends Amy and Brett Trefethen stepped up to represent (last year they fished as Team Hardy). First, Brett won the Drift Boat Rodeo on Friday. That's right, there is a new champ in town and he has the plaque to prove it. Top prize, $150 cash and $50 gift card to Kittery Trading Post. Brett is a long-time whitewater and fishing guide, and I'm sure this was the first time he made that kind of scratch rowing a drift boat for 7 minutes. Congrats Brett! Emily, took second place in the largest fish category. A 14" rainbow was all it took. Emily took her fish swinging a black rubber legged bugger on a sink-tip. 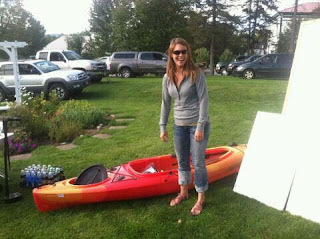 Her prize... a sweet Perception Manatee Angler Kayak, complete with all the bells and whistles, generously donated by LL Bean. I heard the Commissioner of Inland Fisheries and Wildlife, Mr. Chandler Woodcock, took the top spot for "Smallest Chub." Tough break sir! Maybe next year redemption will be in store. Jokes aside, its great to see some positive attention being garnered to this outstanding event and to the Upper Andro Angler's Alliance for working tirelessly to rebuild this fishery to it's potential. Yes, they are serious, you can keep it. Dust off a spot on the mantle; another trophy from the 2 fly!